There was a lot of fuss last week about an alleged iPhone lock screen bug that allowed an attacker to bypass the lock screen and access your iPhone’s filesystem. I wrote an article on iMore explaining that this wasn’t the case and the confusion seemed to be the result of a misunderstanding on how iPhone passcodes work. As mentioned in the article, when an unlocked iPhone is plugged in to a computer with iTunes running (or a locked phone that you then enter the passcode on), iTunes has a mechanism that allows it to access the device’s filesystem in the future without requiring the user to enter their passcode. I ambiguously referred to this “mechanism” because I had absolutely no clue how it worked. All I knew is that the first time you plug a locked device in to a computer, iTunes will give you an error message. 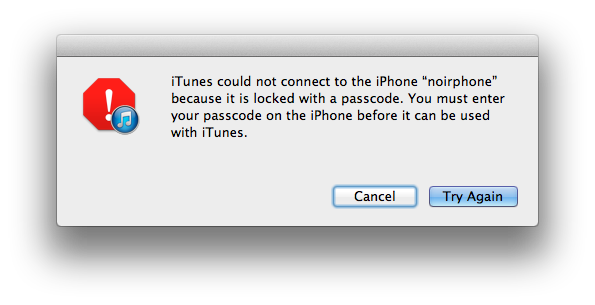 However, once you enter the device’s passcode, iTunes will never prompt you again to enter it on that computer. Whether the phone is locked or not, iTunes (and any other app that can talk to your iPhone) will gladly read files from the device and write new data to it. Twitter user Hubert was kind enough to send me more info about this process. He sent me an article that looks at how iOS 5 backups work. The article briefly explains the use of Escrow Keybags by iTunes (technically I think usbmux is what uses them) to talk to locked devices after they have been unlocked once. The gist seems to be that there are certificates and keys which are exchanged via iTunes when an iPhone is plugged in and unlocked, which are then stored in an Escrow Keybag on the host computer. The Escrow Keybag for every device you’ve ever plugged in to your machine can be found in /private/var/db/lockdown and is named with the UDID for the device that it is for. When a device is plugged in to your computer in the future, this Escrow Keybag is used to unlock the device without the need for the user to enter the passcode. The confusion on the alleged lock screen bypass bug came from this. The bug discovered simply made the screen go black with a status bar still visible. If you plugged this device in to a computer that it had previously been plugged in to while unlocked, the computer used the Escrow Keybag in order to read the file system without needing the passcode. This would have happened with or without causing the black screen glitch. If the person who found the glitch had plugged their iPhone into a computer that it had never been connected to, they would have gotten an error from iTunes saying that the device was locked and they would need to enter their passcode. The original video demonstrating the bug can be found here. A video of the same bug being reproduced, but with the phone plugged in to a computer it has not been unlocked with before can be seen here. My sincerest apologies that I don’t have any block rocking beats accompanying my video.